Gambling is speculative at best, but if someone wanted to get rich quick last weekend, the opportunity was there. After Oregon and Alabama – the two winningest college football programs of the decade — both dropped their conference openers, they found themselves on an unfamiliar side of public opinion, or more specifically, of the Vegas odds-makers’ opinion. · Colorado had lost 11 consecutive PAC-12 games. · Colorado hasn’t defeated Oregon in a regular season game since 1985. · Oregon hasn’t lost two consecutive regular season games since 2007. 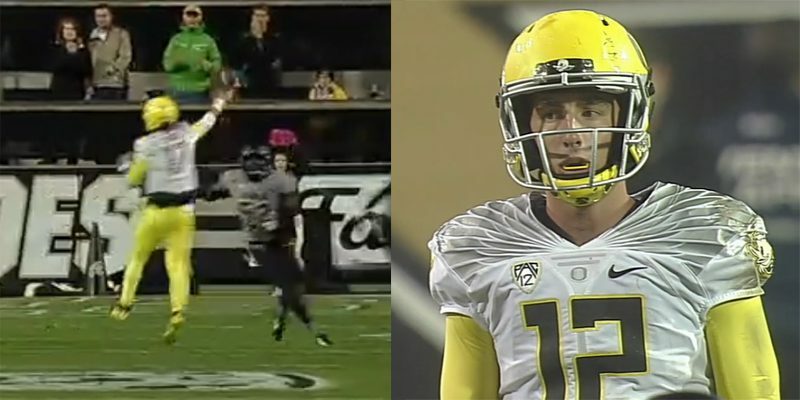 Although an Oregon victory was predicted, the Ducks tend not to win close games. In reality, anytime they are favored by less than a touchdown, their odds might as well be even. Since 2010, Oregon has lost ten times, but of their 63 wins this decade, only three (California 2010, Wisconsin 2012, Oregon State 2013) have been by a touchdown or less. 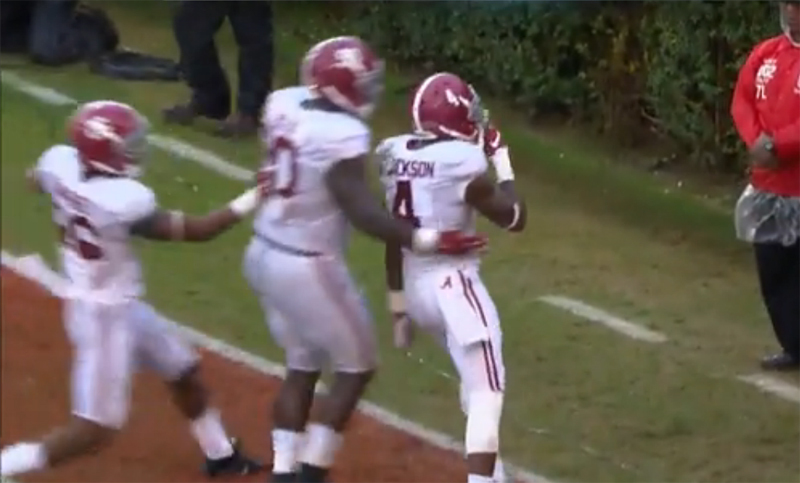 Alabama returns a blocked kick for a touchdown in its 38-10 win over Georgia. The other part to my earning equation involves Alabama: As two-point underdogs against Georgia, the Crimson Tide was not favored for the first time in 72 games. Astonishing? Yes, but keep in mind, Alabama also did not lose back-to-back games since 2008. The Vegas eggheads expected them to lose immediately after losing, which created a promising opportunity for those willing to pick Alabama. The odds-makers were even willing to give better than .500 odds to anyone who felt Alabama would win outright. Given the probabilities, a bet on any combination — legally, of course — of these two outcomes (straight up, in a teaser, or in a parlay) would have made all takers a lot more rich than they were the day before. I jest, of course. Gambling is, most likely, the least sound way a person can invest their money, but the argument is made to prove a point: Odds-makers essentially gave the public 50/50 odds that both Oregon and Alabama would lose, something that, statistically, will happen only once per every seven games this decade, and just happened in their last conference games. Obviously no outcome is a given, but the likelihood of those outcomes favoring Oregon and Alabama, as we saw Saturday, was astronomically higher than 50/50. Bralon Addison throws a touchdown pass to Charles Nelson in the second quarter of Saturday’s game. How does that happen? One explanation is the attraction of correctly predicting trends. Odds-makers are not immune from the allure of trying to predict which way events will go, of successfully prognosticating in a way that makes the winnings secondary to the satisfaction of being correct. Desire like that can fool someone into predicting the fall of a dynasty, overnight. But change on that scale is far more gradual. If our prognosticators were to evaluate Oregon, solely from Saturday night’s box score, they would find that the Ducks are on par with their performances in recent years. They scored the usual 40+ points, won by more than two touchdowns, and, in their typical fashion, ripped off scoring drive after scoring drive in the second half. According to the box score, this is the same team they have always been — up-tempo, downhill. But even though the box score is classic Oregon, the field showed a very different team, one that is still searching for identity, one whose challenges have limited their offense. Yes, formidable as ever on the ground, but struggles to maximize the talent of skill players have threatened the balance of the offense. When it clicks, we see plays like Taj Griffin’s big run or Bralon Addison’s TD pass and recognize the Ducks of recent memory. 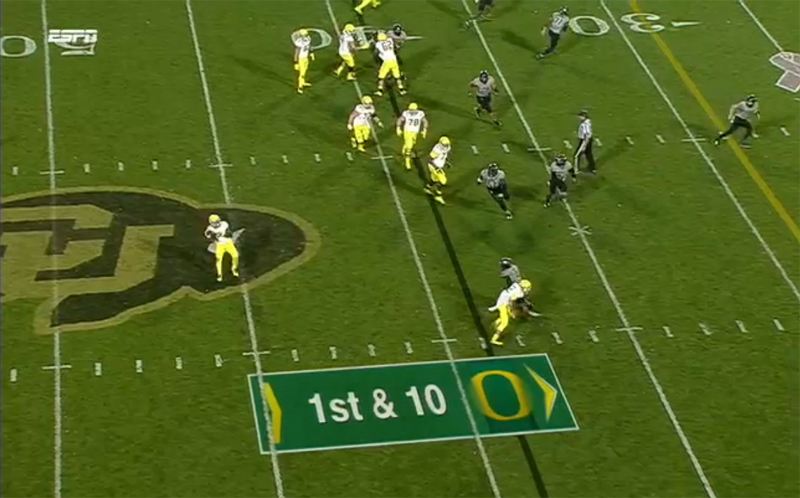 When it doesn’t, Mark Helfrich rotates the quarterbacks in the attempt to find stability. Oregon fans haven’t seen that in nearly a decade. 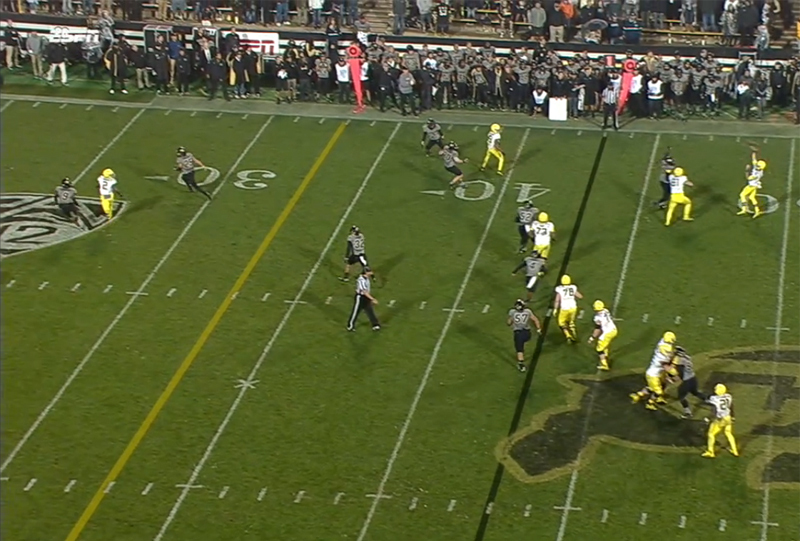 Taylor Alie throws over Bralon Addison (2) to Jalen Brown for the final score in Oregon’s 41-24 win over Colorado. Yes, mystery abounds all in college football this season — including the in PAC-12 — where Cal and Utah are the only undefeated teams. Oregon’s two losses suggest a national title contention in only the most absurd of scenarios, but because their losses were not against in-conference, North Division opponents, a Pac-12 Championship is still a realistic possibility. Here, the Ducks are in control — if they can win their division, they can win the conference. If asked whether the Ducks seize their opportunity in the North, I’d say “I don’t know, stop asking me.” One thing is for sure: Watching them try to pull it off just got a lot more exciting.